CUSHENDUN, Northern Ireland — The many marvels dotting the dramatic Antrim Coast of Northern Ireland include a cluster of eerily beautiful caves in this tidy village, around 45 miles north of Belfast. Formed by 400 million years of shifting red stone and the surging slate-blue Irish Sea, the caves inspire awed reflection upon the raw power of nature and the irresistible imprint of time, among other musings on the mystic. We’d arrived at Dragonstone, or the dazzling headland the Targaryen family stronghold was C.G.I.’d upon, anyway. 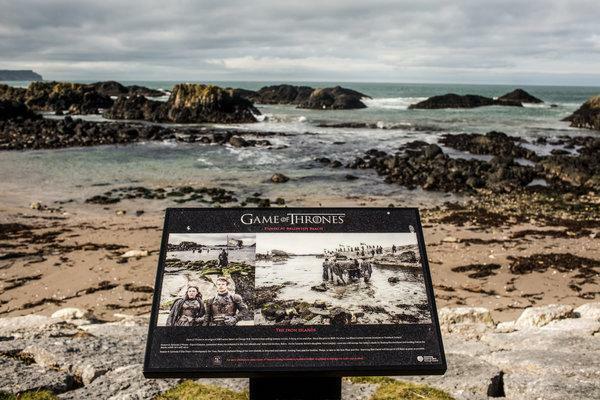 To stand where the impossibly green meadow gives way to gray granite cliffs plummeting toward the sea, as you note the spot where Tyrion and Daenerys argued over strategy, where Jon Snow met Drogon, is to feel the frisson of an epic story meeting an epic landscape. This reciprocity between project and place extends beyond the countryside. Another reason the marriage between “Thrones” and the region has been happier than any on the show is that the production’s material needs — armor, medieval weapons, elaborate costumes and jewelry — meshed well with the area’s longstanding artisanal traditions. “We’re good at that stuff,” Williams said. The swarms figure to increase when HBO turns several former “Thrones” sets across the region into immersive tourist attractions featuring costumes, weapons and other artifacts from the show. The first, the Game of Thrones Studio Tour at Linen Mill Studios in Banbridge, is slated to open in the spring of 2020. A still more immersive wallow in “Thrones”dom awaited me at Castle Ward, about an hour south of the city. The guide William Van der Kells greeted me in full Northern regalia: a black cloak and faux fur collar with a shiny gauntlet on one hand, holding a large sword made of “the finest Valyrian rubber.” A longtime National Trust site, Castle Ward added a “Winterfell tour” after the show shot much of the first season on the property, and promptly brought in more than 25,000 additional visitors a year.